The word “Genesis” evokes many things. There’s Biblical imagery. There’s the literal translation, which means the origin or formation of something. But does the word Genesis also bring about thoughts of luxury? Hyundai sure hopes “Genesis” makes you think of luxury. That’s why they created their first-ever luxury sedan in 2009, the Hyundai Genesis, and it was origin of something special. For 2015, Hyundai starts a new generation of Genesis, with a completely remodeled the luxury sedan and there is also a coupe version available if you desire. I was fortunate enough to get behind the wheel of the 2015 Hyundai Genesis this week, and I can confirm that plenty of excitement and emotions are evoked from driving this car. 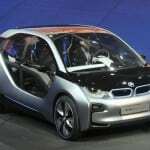 But can this second-generation sedan make enough headway in the ultra-competitive and exclusive luxury sedan market? I mean, it is “just a Hyundai” after all, or is it? 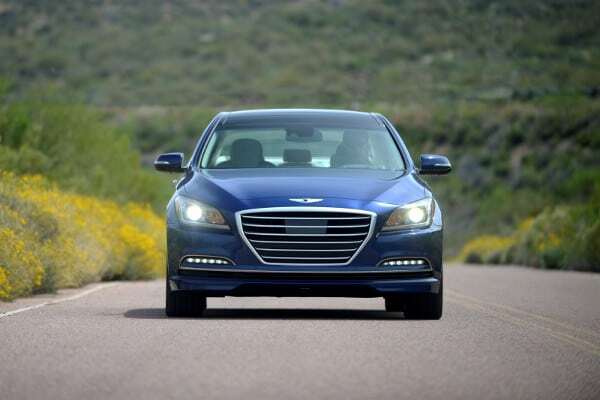 Keep reading this 2015 Hyundai Genesis review to find out. Shaking that “just a Hyundai” reputation was job one during the initial launch of the Genesis, and continues now with the second generation. On looks alone, it barely resembles a Hyundai. In fact, with the stout outward appearance, on first glance, the Genesis screams luxury. 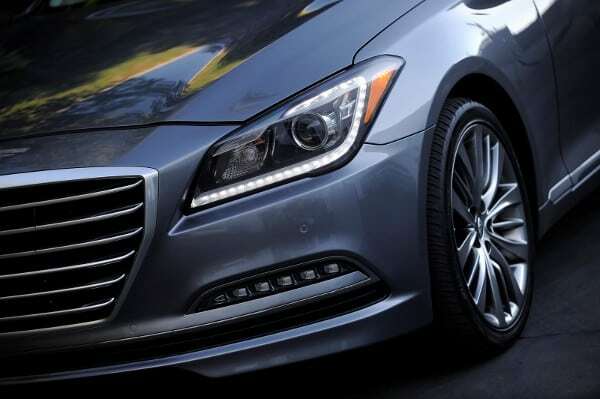 A separate Genesis badge on the grille leaves any Hyundai affiliation behind. Squint your eyes and there’s a Bentley-like resemblance. Intentional and subtle refinements were made to the 2015 version of the Genesis to up the overall appearance. The Genesis is built on a new platform, which includes a longer wheelbase. The longer, sleeker appearance only further deepens the Genesis’ pedigree. The powertrain remains in tact for the Genesis, with two engine offerings. 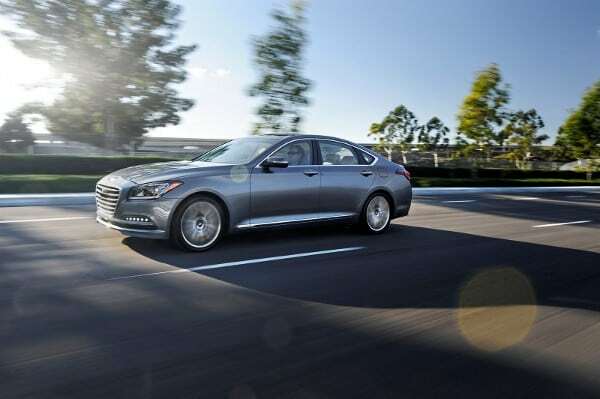 The 2015 Hyundai Genesis comes with a 3.8-liter V6 engine or a 5.0-liter V8 powerhouse. My tester was the 3.8-liter offering which still yields 311 horsepower. An eight-speed automatic transmission assists the driver throwing subtle, controlled shifts, all in quiet comfort. 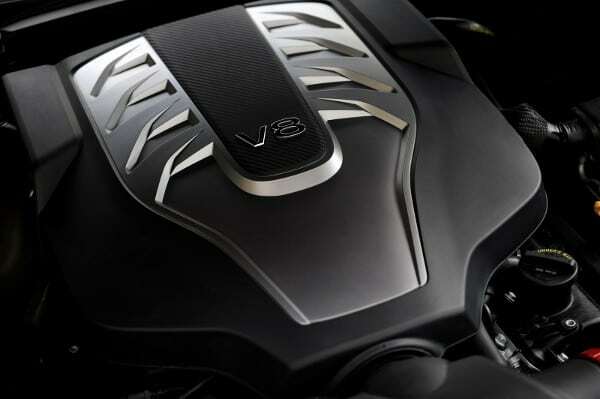 The V6 engine is well powered and continues to perform well. While most models will come with rear-wheel drive standard, my tester featured the optional all-wheel drive. This is the first time Hyundai has offered AWD in the Genesis. Because the Genesis is long the all-wheel drive is appreciated. It improves the handling and overall driving performance. While I appreciated the quiet, refined ride of the Genesis, it was far from agile. 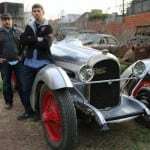 It drove big, which is probably the intention of the engineers as they aim at traditional Cadillac buyers. The interior of the Genesis is immaculate. Sitting inside the Genesis feels like you’re in the cabin of any European luxury brand. High-quality materials and soft touch points abound and the organization of the center stack and dashboard is clean and simple. Unlike some of the European counterparts, the Genesis employs a more minimalist appeal to its technology. 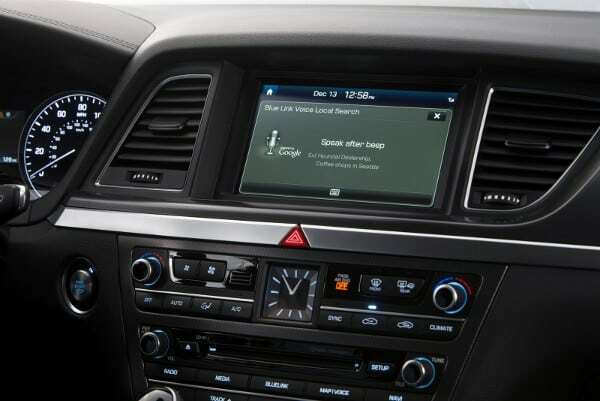 An intuitive 7-inch touchscreen runs the infotainment. It is easy to operate and aesthetically pleasing too. By adding three inches in length, rear legroom is added. 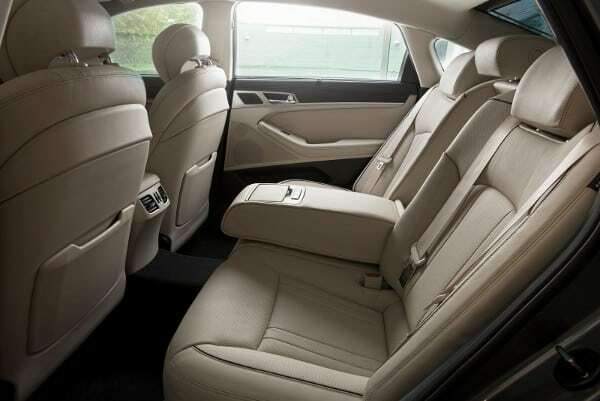 The previous generation already had ample legroom, now the 2015 Genesis provides amazing room for rear passengers. 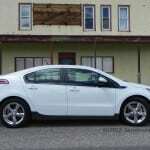 All passengers will enjoy soft, comfortable leather seating with independent climate control. Fuel economy for the Genesis is a little disappointing. 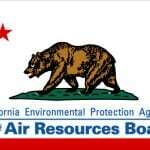 Standard EPA rating for the rear while drive Genesis is 18 city and 29 highway. 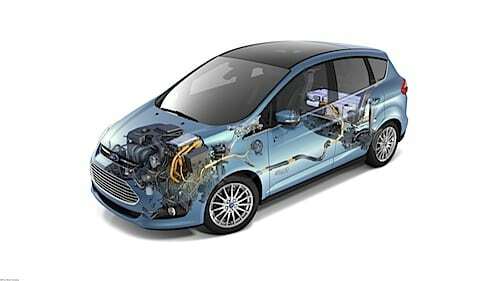 For my AWD version fuel economy drops further with a 16 city and 25 highway rating. In a week’s worth of heavy-footed driving, I averaged barely 19 MPG. Hopefully Hyundai can continue to find ways to improve upon the fuel economy, perhaps by dropping the engine size a little, or dropping weight (although I enjoyed the performance of the Genesis in its current form). 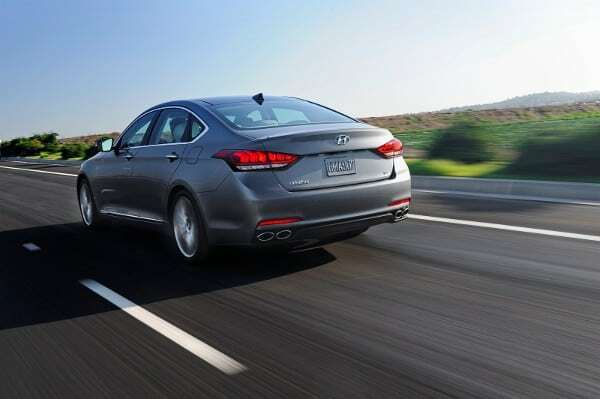 Where the Genesis separates itself from the rest of the luxury sedan segment is in price. In this regard it’s still very much a Hyundai. Starting price for a basic Genesis is $40,500, which is by far the least expensive of any luxury sedan of similar size. My tester came with all three available options (i.e. add ons). The signature package includes a panoramic sunroof, ventilated front seats, blind spot monitors and cross traffic alert. The tech package offers goodies like adaptive cruise control, haptic steering wheel and parking assistance. The ultimate package adds such niceties as matte finish wood trim, a 9.2-inch high definition display and a 17-speaker audio system. With all these extras, my tester had a final MSRP of $52,450 putting the Genesis up in the starting price for the most basic trims of its competition. The price may be “cheap” but there’s nothing cheap feeling about the Genesis, so how Hyundai manages to create such luxury for so much less is a mystery.